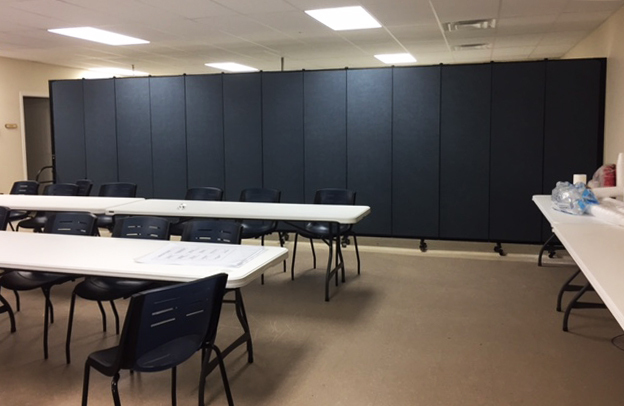 Uses: Conference Area/Meeting Room Colors: Blue Lengths: 13 panel 24'-1" Heights: 7'-4"
Linn Energy contacted Screenflex looking for a solution to their growing need for more meeting space. The environmental company had an idea to divide a large multi-purpose room into two rooms for meetings, conferences, as well as a dining room. After searching a “track” style room divider system, Linn discovered they needed a solution that wouldn’t interfere with the electricity and ductwork in the ceiling. Screenflex portable room dividers were the perfect solution. Since Screenflex room dividers are freestanding and roll on wheels, they allow the light, heat and air conditioning to flow freely throughout the room. Better yet, we were able to match the blue fabric portable wall color to the blue chairs already in the room. For added durability, Linn chose a heavy-duty room divider. View the Screenflex portable room divider comparison page to view the most popular lines. “Thank you so much for the professionalism in the ordering, before deal line delivery, and an amazing product. It looks great in our field office conference room. I am very thankful to you!” -Linn Energy employees.